The group had been larger when originally planned, but due to a variety of circumstances, only the three of us ended up going. I flew from St. Louis to Reno on Friday, 3 July, and drove down to Mammoth. After the 5:30 re-opening of the Minaret Summit road to private traffic, I drove over the ridge to Agnew Meadows to survey the situation at the trail head. The water running across the road back to the trail head had subsided somewhat from Owen's report earlier in the week, but there were still big drifts of snow in the parking lot, and signs warning that the area was closed to vehicles. So much for being able to drive ourselves to the trailhead. Owen and I met up on Saturday morning to do a little recon hike on the west side of Mammoth Mountain. We drove up to the parking lot at Minaret Summit, driving between walls of snow still six to eight feet high in spots, carved out by the snow plows. From Minaret Summit, we could see Ritter and Banner still cloaked in their winter finest, looking much more like the winter postcards sold around Mammoth than a typical 4th of July weekend. 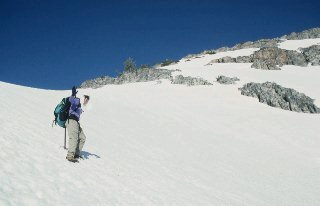 We crossed over the Minaret Summit Road and headed up toward "Wooley Peak", myself on foot, and Owen on skis, initially. However, after 100 yards or so, Owen decided the sun cups were more conducive to walking than skiing, so we hoofed it on up on the west side of the Mammoth ridge to a vantage point from which we could survey the planned summit route. 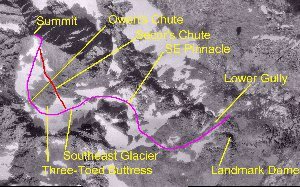 Owen's suggestion for getting up the prominent buttress which stretches from the southeast glacier to the upper bowl and summit slope was to use the left chute, as marked on the larger copy of the image above. Nancy and Yehuda arrived the evening of the 4th, and we packed up our gear for the next day's hike in. With the parking lot at Agnew Meadows were still closed, we had to pony up the $9 fee at the Mammoth Lodge for a shuttle ride over the top and down to Agnew Meadows. That also made for a bit later start on the trail, but with only seven or eight miles ahead of use, we were not pressed for time. In a short time, we were up the steep grade from the river crossing to Shadow Lake, where we were treated to the classic view of Mt. 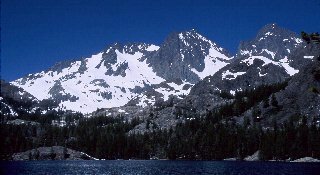 Ritter and Banner Peak. The hike in was pleasant for the most part. There were still significant snowdrifts over the trail even as it passed through Agnew Meadows (8,400'), but the trail down the slope to the San Joaquin river was clear, as was the set of switchbacks from the river up to the outflow from Shadow Lake. 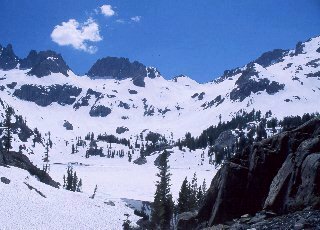 Once at Shadow Lake, the snow cover became heavier and more continuous, and by the time we were halfway to Ediza Lake, we were on snow 80% of the time, following the "i" (Inyo) blazes on trees by looking DOWN to knee level or even down into the tree wells to see them. Only the rocky ridges were free of snow, and those generally required climbing up on snow in clefts to get up onto the rocks. Owen hit his day-hike turnaround time and headed back to Mammoth, wishing us well in our attempt the next day. As we approached Ediza, we found that the snow still bridged Shadow Creek in spots, but looked awfully tenuous, with lots of holes and thin spots. As a result, we didn't try to follow the use trail which parallels the creek, but scrambled higher up onto the rocky slope above the north side of Ediza. What a view! Ediza Lake was still 95% frozen, with just a small area of open water at the outlet to Shadow Creek. The main inlet creek on the west end of the lake was still mostly bridged. There was absolutely no bare ground anywhere around Ediza. Just the rocks sticking out here and there, and, of course, the tree wells. We chose a campsite above Ediza in the shelter of some trees with a nice flat granite outcrop nearby for our kitchen setup. With the bear bags hung and a day-and-a-half worth of food in a BRFC, just in case, we settled in for the night. Yehuda and I got up early (we thought) and headed up about 6:30. The plan was to climb up via the Southeast Glacier and on to the summit of Ritter. We started out in the right gully up above the west end of Ediza, then made a slight but annoying mistake in not going high enough up the gully before turning to the right. If you look in the photo below, we turned right just above the rock with the scrub trees on it, only to find that we needed to be a couple of hundred feet higher in order to avoid some serious rock climbing. That error cost us nearly an hour of head-scratching, scrambling, and backtracking before we were back on-route. From there, we went over a low ridge and contoured around a bowl which is hidden behind some lower humps as you look up from Ediza. We reached the Southeast Glacier in good time, and took a short break on the big rocky outcrop in the middle of the glacier. From the outcrop, there is a terriffic view to the east, with the still-snowbound Nidyver Lakes to the left and Ediza lower and just to the right of center. 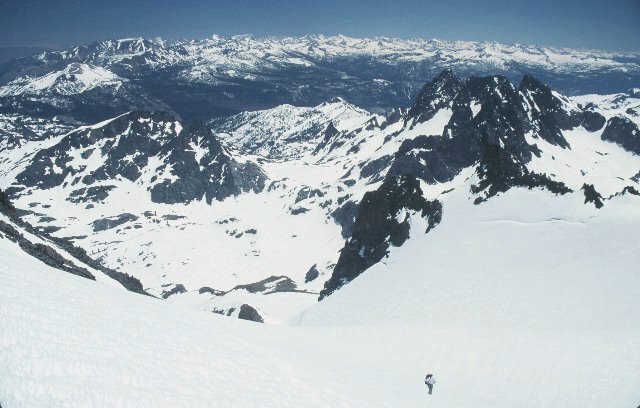 Looking to the northwest, the two primary chutes through the buttress and onto the upper snow bowl were clearly visible, forming a prominent 'Y' with their snowpack extending all the way down to the glacier. The left of these two chutes stopped John Fraser and me in 1994, and the two of us never even saw the right-hand chute, as we were onto the rock and into difficult scrambling even before reaching the branch of the 'Y'. With full snow cover, either would have gone fairly easily, but we were after yet an easier route, farther to the left and on the uphill side of the buttress. The remainder of the southeast glacier was an easy snow slog through moderate to deep sun cups up past the "three-toed" buttress and making a sharp right turn into Owen's chute. The chute is rather steep but straightforward, and there was all of 15' or 20' of bare scree at the top to be negotiated before hitting the upper bowl leading up to the summit of Mt. Ritter. It was getting fairly late (noonish) but we still felt confident of making the last 1,200' of the climb. We crossed the upper bowl and headed up-slope toward the summit ridge. Here, we found tracks of a ski mountaineer who had been up there the day before, and followed these rather than breaking a trail afresh. As we neared the upper left corner of the slope, the snow thinned out, and we started postholing. Both Yehuda and I had fallen through hard enough to get our crampons jammed in the packed snow and rocks as we fell, and we used valuable time and energy extricating ourselves. At 12,600', a mere 500' or so below the summit, we approached our turnaround time of 2:00 p.m. By that time, we were both weary after the past couple of hundred feet of tenuous snow, and were making very slow progress. We tried briefly heading back out toward the middle of the slope, but kept punching through the thin spots. Knowing it was late already, that we were extremely tired, and that it was time to turn back, we reluctantly headed down without getting to the summit ridge. The climb back down was uneventful, but once we got down to the still snow-covered meadow above Ediza, we had a bit of difficulty locating our campsite without the usual summer landmarks, so it was 6:30 by the time we reached camp again. The next morning, we discussed whether to stay around and rest a day and give the mountain a second try on Wednesday. We rapidly reached the consensus that we would be better off waiting a year and trying again in 1999. 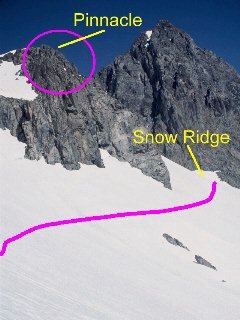 We are both convinced that our best bet will be to use the same route again (it definitely goes easier than any other I've tried), but to plan on a bivouac on the rock in the middle of the SE Glacier, cutting at least 1,500' off the summit day's climb and therefore greatly increasing the chances of success. A few last photos of the campsite, then time to pack up and call it a trip. The hike out went smoothly...just a couple more days of melting had opened up much more of the trail, plus the main inlet creek to Ediza had broken through from the lake up into the drainage from which it flows. From the looks of it, it would NOT be a fun time to try and wade it...wide and fast and certainly over knee-deep, and c-o-l-d, for sure! We arrived back at Agnew Meadows in plenty of time to catch the shuttle back to Mammoth. Nancy and Yehuda checked into a motel and I borrowed their shower to wash off the trail dust before returning Owen's BRFC and heading up to Reno so I could catch the 6:35 TWA flight back to St. Louis in the morning. If this had been planned as a reconnaissance trip, it would be 100% successful. We now know exactly the route to follow and are prepared to give it another try next year. As a summit attempt, well, we fell (oops, bad choice of words!) just a bit short, so our names are still not in the log at the top, but they will be, some day! Please note: Images linked to the postage-stamp photos on this page are large. You will have to pan right/left and/or scroll up/down to view the full images. I have done this in order to show the maximum detail possible. Disclaimer: Mountaineering poses significant risks. The route description which follows is not meant to train anyone in climbing techniques. If you fall off the mountain and break your fool neck or any other part of your anatomy, do not send your lawyers, heirs, etc., after me, the Peak Climbing Section, or whomever. You decided the rewards were worth the risks and you accepted those risks when you left the trailhead. Let's get our bearings with a nice wide shot of the whole Ritter Range. 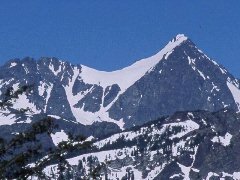 This one is taken from "Wooley Peak", a hump on the west side of Mammoth Mountain, and a convenient spot from which to view the upper part of Mt. Ritter. Starting from the extreme right edge of the image, we have Banner Peak (12,890'), the Ritter/Banner saddle, from which the classic John Muir route makes its way up to the summit, then Mt. 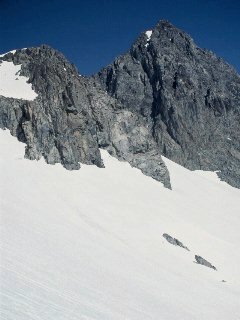 Ritter (13,150'), itself. Finally, the left-hand third of the image shows the Minarets. We'll come back to a close-up of Mt. Ritter from this same vantage point in a moment. Looking west at a view from above where Shadow Creek exits Ediza Lake, we can get a good idea about the first part of the climb. The major landmark for the lower gully is that dome to the west of Ediza, circled in this view. The gully is just to the right (north) of the dome, and the trick (as Yehuda and I found out the hard way, is to stay in the gully almost all the way to the ridge. Note the pointers to the rocks with the scrubby trees, and then the actual turning-point rocks quite a bit higher up. In this case, we could have turned just below those upper rocks with equal success, but going above them puts you onto even flatter terrain as you meander over the ridge to the bowl. Note that the route goes behind the rocky ridge...you can't see it in this view, but it is a nice easy area once you're up there. The typical campsite area above Ediza is in that large clump of trees, just above the lake. This year, we camped considerably higher up, and a bit to the east. Depending on whether you are using BRFCs, or making do with a traditional bear-bag hung from a tree, it would take up to a half-hour or so off the climb if you pick a campsite right up at timberline, as close as possible to where the gully intersects the valley through which the outlet stream from the Ritter/Banner glacier makes its way down to Ediza. Once you have gotten to the top of the gully and made your right turn at the upper clump of rocks, you walk over a shallow ridge and are at the south end of this snow bowl. 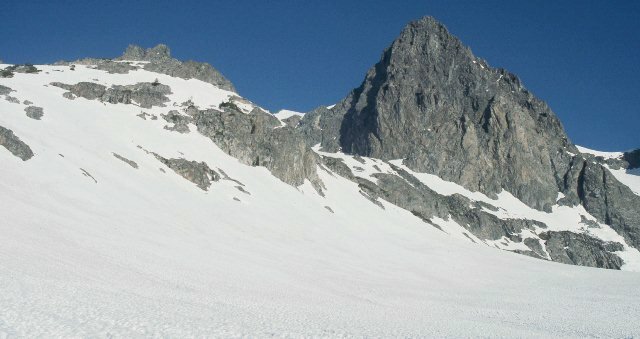 The pinnacle at the southeast corner of the Southeast Glacier is your landmark. 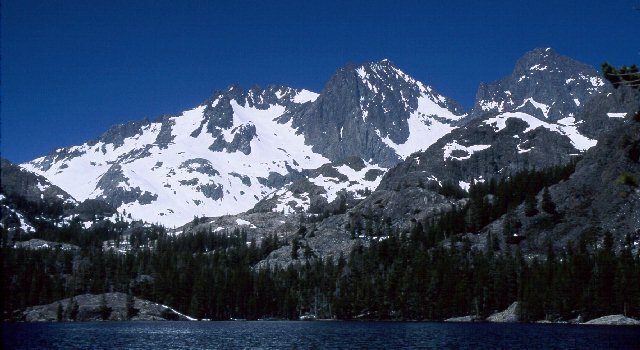 It typically has a drifted ridge of snow angling down from it, as it does in this shot. Traverse the bowl, staying basically level with where you started. The only area to consciously avoid is right up next to the rock, where there is a distinct separation between rock and snow. 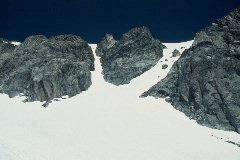 Once you get around to the snow ridge, climb over it and you're on the SE Glacier, proper. Our first look at the top part of the climb will again be from the vantage point of Wooley Peak, which gives a good view of the route up from the SE Glacier all the way to the summit. I have shown both a plain and a marked-up version of this shot since the chutes are pretty narrow and tend to be obscured by the route marking. The three chutes are clearly visible. 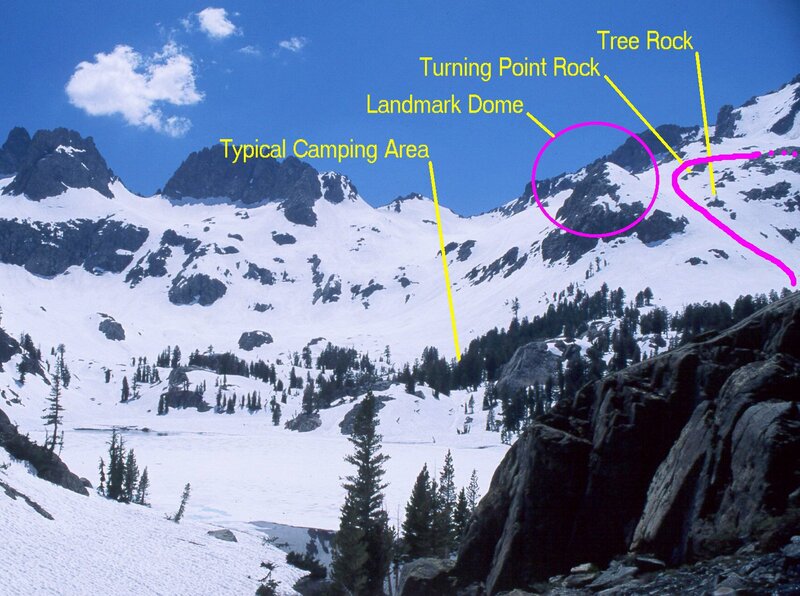 From the description in Secor, I infer that he suggests climbing the first, or right-most chute up to the summit bowl. Not having tried this, I cannot give first-hand guidance on its ease or difficulty, but it looked eminently doable from below. Owen Maloy advises that the snow headwall at the transition from chute to upper bowl can be a bit dicey since it gets quite steep due to the winds and drifting. However, others this year have reported that it was not particularly difficult. Caveat emptor! The middle chute, on the other hand, I have experienced, back in 1994. When snow-free, it is filled with hand-to-dinner-plate-sized pieces of loose slate which have an incredibly low coefficient of friction. I do not recommend this chute, for obvious reasons! The third chute, marked "Owen's chute", is the widest and most gradual of the three. With a heavy snow season, it was 99% snow-filled, with just a bit of bare scree at the very top...not even enough to be worthwhile taking off crampons to scramble over. The definitive way to this chute is to make sure you stay on the SE Glacier all the way around the "three-toed buttress" (which only has two toes in this year's heavy snow). Once around the buttress, you make a sharp right turn and head up the chute to the upper snow bowl and summit slope. Having made it up Owen's chute, the view of the summit bowl, summit ridge, and summit is before you. From here, the route is straightforward up to the summit ridge. We actually switchbacked a bit, ending up over near the rocks at the left side of the bowl, before running into thinning snow that had us postholing into the talus below. We made it as high as the second finger of talus sticking out into the bowl on the left-hand side before hitting out turnaround time and heading back down. The next time, I would try a more direct attach on the upper bowl and slope, as indicated by my route line in this photo. The slope is not terribly steep, and the slower straight-uphill pace would be more than balanced by time not spent switch-backing. The annotated image to the right is built up from USGS orthophotoquads downloaded from the Microsoft TerraServer site. It shows the area above Ediza Lake and on up to the summit of Mt. Ritter. The area covered is 2400 meters by 1500 meters. Resolution of the postage-stamp image is approximately 8 meters per pixel. Resolution of the 600 pixel image is approximately 4 meters per pixel. 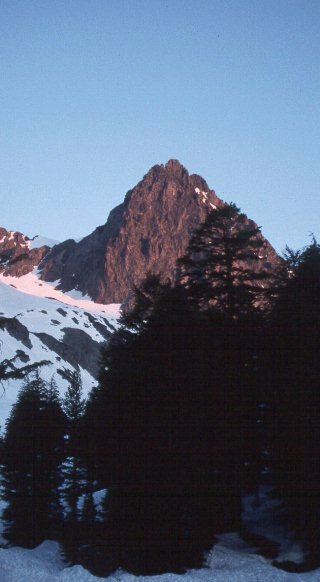 The 950 k-byte full image shows 1 meter per pixel, the maximum resolution of the USGS photo data available for download. The names given the major landmarks on the annotated map correspond with names on the slide scans above. They are not correlated with place names on the topo maps, but are merely my nomenclature to allow easier descriptions of the route. 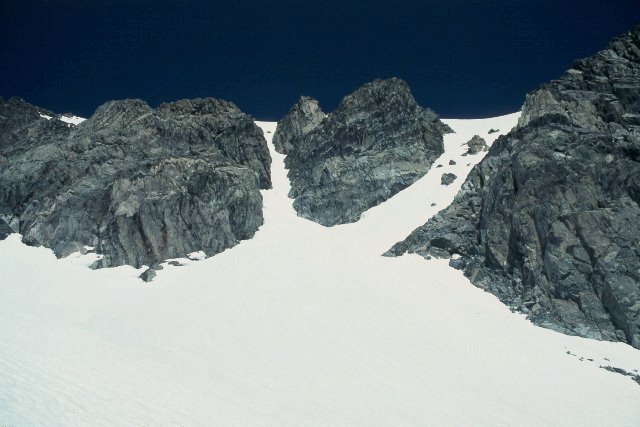 In the USGS photos, the stream flowing out of the Ritter/Banner Glacier is readily visible, and the division of the stream where it flows around a bump in its valley is a good landmark for the start of the climb. Looking southwest from that point, you will see the "landmark dome" which marks the south (left) side of the lower gully. 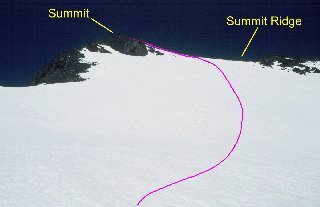 As described above, you ascent the gully nearly to the ridge above it, then turn right and contour around the pinnacle at the southeast corner of the Southeast Glacier. 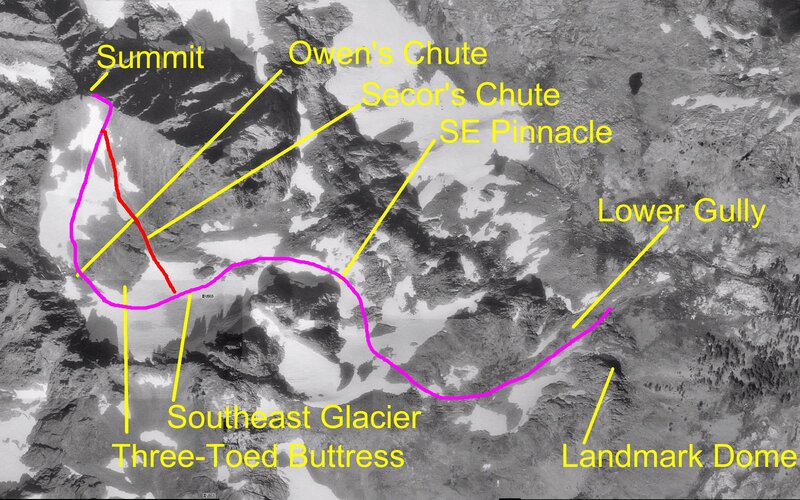 From there, you have the choice of the standard Secor route (annotated in red on the aerial photo) or the easier (in my opinion) route up Owen's chute. Once into the upper bowl, attaining the summit ridge is either a snow or talus slog, depending upon the time of year and amount of remaining snow cover. From what we saw, you would want to hit the ridge a bit to the right (east) of the summit and follow the ridge to the summit, proper. I'll have to wait until 1999 to determine that for certain, of course! 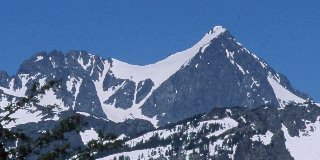 The view from "Wooly Peak", on the west side of Mammoth Mountain, showed just how much snow was on the upper reaches of Mt. Ritter in early July. The second, marked-up, photo below shows our planned route up the southeast glacier, the third "easy" chute (according to Owen), and then up the upper bowl to the summit ridge. A minor photographic tragedy has befallen us...there used to be a perfect snag hanging out over Shadow Lake just a few yards west from this point, which had been my standard "frame" for this shot, but it finally succumbed to a winter storm and was down in the lake. However, using Shadow Lake for the foreground still provides one of the most picturesque views of "my" mountain. The John Muir Trail crosses the Shadow Creek Trail (and Shadow Creek) on its way down to Red's Meadow. 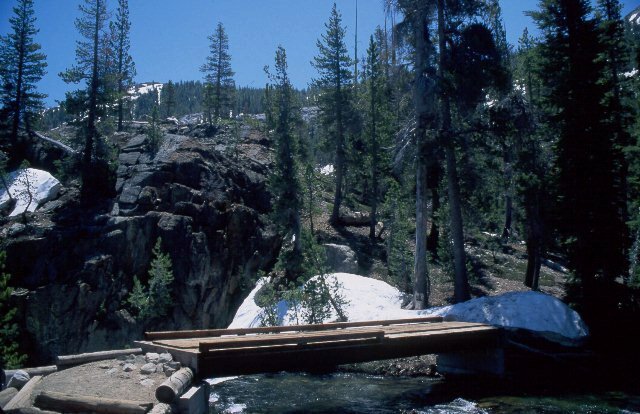 These four-foot drifts of snow across the JMT on the south side of the bridge were typical of the area immediately above Shadow Lake, at about 8,800' (2675 meters). The El Nino snow over the winter had most definitely not melted out at the 9,260' (2,820 meter) altitude of Ediza Lake. The small patch of open water to the left of the rocks in the foreground is where Shadow Creek exits Ediza. The inlet creek, and another, smaller, patch of open water is barely visible at the far side of Ediza. From this point on up, any area flat enough to hold snow was still snow-covered, with only steep slopes and rocky outcrops free of snow. In most of the area, the snow would be measured in feet, many times in tens of feet. The sky was clear, the sun was starting to come up...it looked like a perfect day for our summit attempt. In a normal year, this view would be of an alpine meadow, a small creek which flows out of the Ritter/Banner glacier, and rocky slopes up to the low cliffs in the center and right, leading up to the southeast glacier. 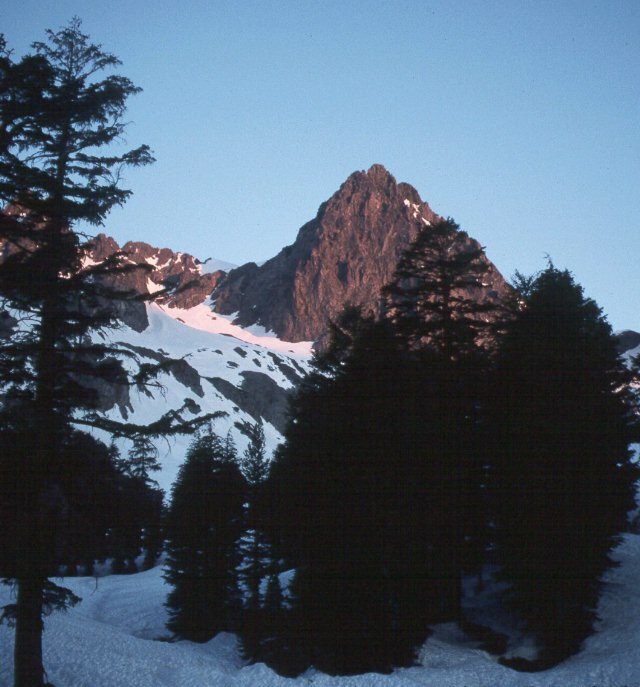 1998 was a bit different, as the creek was barely visible as a smooth indentation in the suncupped snow, and the gully, to the extreme left in this shot, was still totally snow-filled. We were making good progress at this point, but were about to make our one significant mistake of the day. We thought the rock above Yehuda with the trees was our landmark to turn right and into the bowl below the corner pinnacle. Wrong, oatmeal-breath! Those rocks are about 2/3 of the way up the gully, and turning right at them dumps you into a series of tough 3rd-class to low 4th-class rock climbing moves, which we were loathe to undertake without protection. As a result, we had to backtrack to the tree-studded rocks, then once again turn up-slope to the true ridge, not what looks like the ridge from this vantage point! The proper exit to the right from the gully will actually take you behind and above the rocks at the top-right part of this photo. After climbing the gully from the meadow above Ediza, you walk over a low ridge and into this large bowl. From the ridge, the route contours around the bowl, just low enough to avoid the edge of the snow up by the pinnacle. 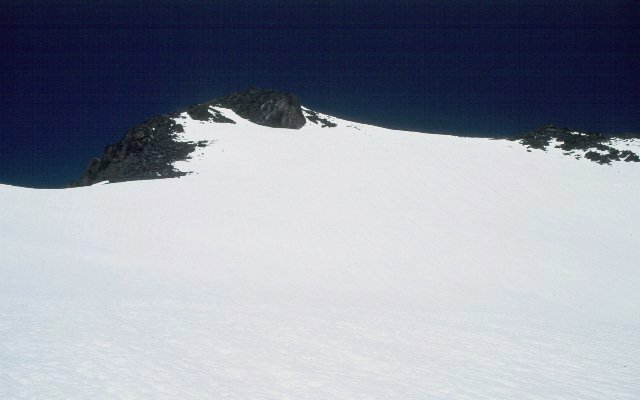 Then cross over the fairly steep ridge of snow extending down and to the right of the low pinnacle which is at the southeast corner of the southeast glacier. This puts you onto the glacier, proper, just about level with a large rock outcrop which is a convenient spot to take a quick break and reconnoiter the next phase of the climb. This shot shows the panoramic view from the edge of the southeast glacier. This large outcrop is a convenient spot from which to enjoy the view and get ready to continue upward. Ediza Lake is the frozen oval just to the right of center. The trio of Nydiver Lakes is in the flat spot to the left of center, still thoroughly snowed in. Shadow Lake is hidden behind the ridge beyond Nydiver Lakes. As I read Secor, his preferred chute is the right-hand branch of the 'Y' in the snow. From the looks of these, when snow-filled, it's the climber's choice of either of these, or the third, wider, chute that we took around the far left side of the buttress. Reports I've heard say that the headwall of snow at the top of the right-hand chute can be a little intimidating but is not terribly difficult. 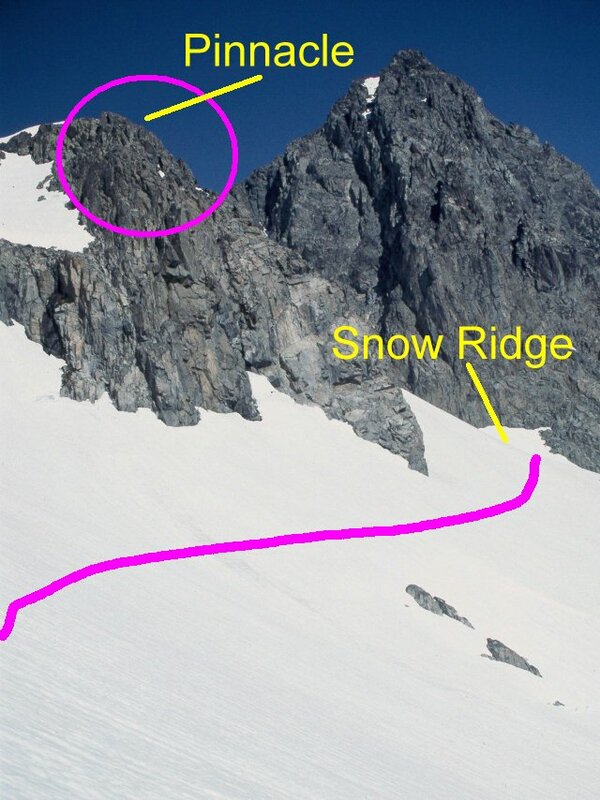 Other than that, either the first or third chutes are walkups with ice axe and crampons. Looking up from the summit bowl toward the summit ridge, our goal looked tantalizingly close. The ultimate obstacle lay ahead in the upper part of this snow slope, where the snow was thin enough to dump you unceremoniously down waist-deep into the talus below. A couple of times of that happening, taking several minutes each time to extricate our feet, and we realized we were not going to make the summit by 2 p.m. We stopped on the rocks to the left in this shot, rested a few minutes, and decided that the mountain would be there next year, so we might as well call it a day and avoid a sprained ankle, wrenched knee, or worse. This shot is looking from the same spot as the previous one, but the opposite direction, down past the upper bowl and out across a panoramic view to the southeast. The slope is only moderately steep, less than 45 degrees, and a comfortable climb. Yes, that really is my 75cm REI Mountain Axe buried to the head as a front tent stake for my summer tent! It was nowhere near bottomed out, either! We were glad that Yehuda had brought his shovel, too, as there was quite a bit of landscaping (snowscaping??) required to level out spots for the tents. 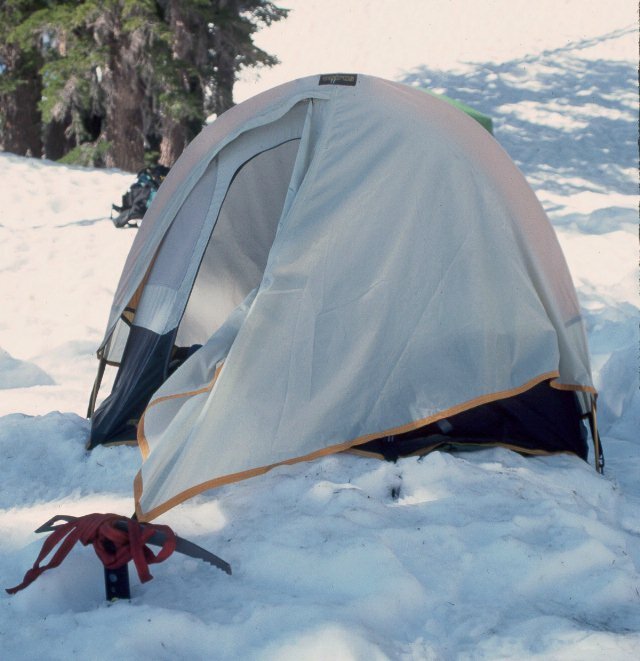 The snow at least made for comfortable sleeping and no worries about those sneaky Sierra rocks and pinecones that crawl under your tent and lodge right under your hip in the middle of the night! !